Week 123: Experts in authoritarianism advise to keep a list of things subtly changing around you, so you’ll remember. Conway included pages on “narcissistic personality disorder” and “antisocial personality disorder,” saying Trump’s “condition is getting worse” and that “there are now fewer people” to check his worst impulses. On Monday, Trump 2020 campaign manager Brad Parscale tweeted: “We all know that Trump turned down Mr. Kellyanne Conway for a job he desperately wanted.” This statement is false — Conway turned Trump down. The Washington state senate passed a bill 28–21 to require presidential candidates to release five years of tax returns in order to appear on the primary or general election ballot. It will now head to the assembly. On Thursday, surrounded by conservative college activists, Trump signed an executive order making federal funding for universities contingent on freedom of speech on college campuses. The order was mostly for show. The Atlantic reported Alexander Ionov, the founder of an NGO called the Anti-Globalization Movement, raised money to fund Maria Butina’s legal defense, reaching about 2 million rubles (approximately $30,000). Josh attended a three day exclusive investor conference where Crown Prince MBS promised to spend billions of dollars. Kushner was granted private conversations with high ranking Saudi officials. On Tuesday, Trump named Stephen Dickson, a former executive of Delta Air Lines, as the permanent head of the Federal Aviation Administration. The position had been filled by an acting director for 14 months. On Saturday, Politico reported on a leaked recording of oil executives at a private meeting at a beachside Ritz-Carlton in Southern California laughing about their access to the Trump regime. The DOJ said Mueller has not recommended any further indictments. It was unclear if Mueller found Trump committed a crime, but did not charge him due to DOJ policy that a sitting president cannot be indicted. On Friday, Democrats signaled they were ready to fight for the public release of Mueller’s complete findings on social media, on air and in statements, concerned that Barr may hold parts back to protect Trump. 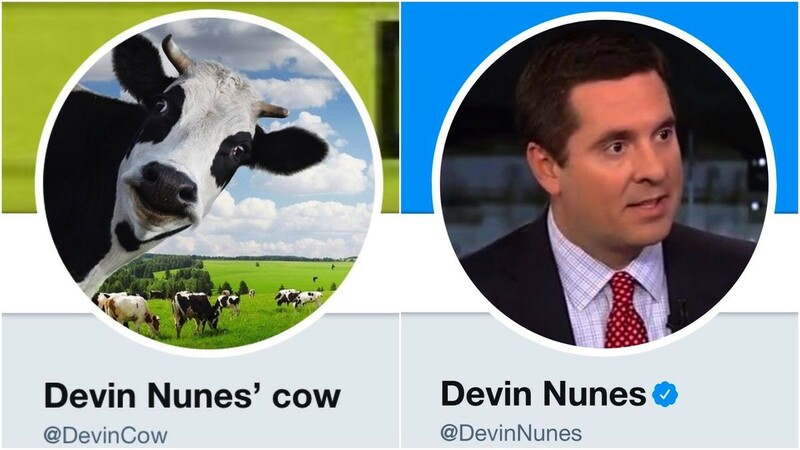 Left, the Twitter feed @DevinCow, or “Devin Nunes’ cow,” which mercilessly mocked Rep. Devin Nunes of California this week. At right, his real twitter account. On Wednesday, Nunes filed a defamation lawsuit against the cow, and Twitter, in a Virginia court.